MANAV KAUL TAKES VIDYA BALAN ON AN IMPROMPTU SCOOTER RIDE! 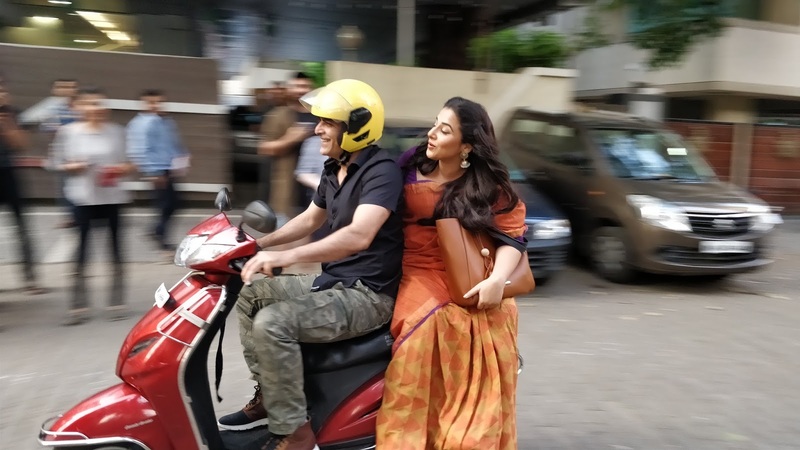 In the forthcoming “Tumhari Sulu”, Ashok (Manav Kaul) might drive Sulu (Vidya Balan) around in a Maruti Zen, but in real life, Ashok (wearing a helmet, thankfully) decided to floor his reel partner Sulochana (a.ka. Sulu) by taking her an unplanned scooter ride through Mumbai’s Andheri by-lanes yesterday. After completing press interviews, Manav borrowed a journalist’s scooter and took Vidya pillion on a short but fun ride. Vidya, true to her sporting, curious and enthusiastic character of Sulu, agreed and thoroughly enjoyed the experience; one she hadn’t been through in a long time.